Khartoum Governor, Police Lieutenant General / Hashim Othman al-Hasan, had ordered the urgent formation of the committee under chairmanship of Khartoum State's director of legal affairs and membership of Chief Prosecutor of Omdurman District and other officials. Quoting Sudan's News Agency (SUNA) the governor instructed the investigation committee to gather evidence, conduct inquiries and raise a comprehensive report on the incidence within 48 hours. On the other hand, Amnesty International issued a statement about the incidence stating that "Sudanese security officers last night entered a hospital and fired live bullets and teargas horrifying patients and hospital staff as they pursued people seeking treatment after they sustained gunshot injuries during protests earlier in the day in Omdurman, on the outskirts of Khartoum". Commenting on the attack, Sarah Jackson, Amnesty International's Deputy Director for East Africa, the Horn and the Great Lakes said: "This attack on a hospital is an outrageous violation of international law." 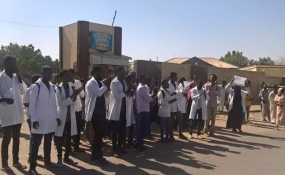 She further explained that "Patients and doctors in Omdurman Hospital were attacked with tear gas and live bullets as Sudanese security forces ramped up their mission to suppress peaceful protests." Jackson called for an urgent investigation into this horrific attack and demanded that all officers involved must be held accountable. Since 19th December 2018 Sudan has been witnessing waves of popular protests against price rises and other economic hardships. The protests have escalated into broader calls for an end to the rule of President Bashir, who came to power in an Islamist-backed coup in 1989. Official statistics revealed that 24 persons had been killed so far during these protests, while international organizations' estimates put the figure of killed individuals at 40 dead civilians at least.